This is the back story to the first Lean leadership course in higher education. To my knowledge, I was the first full-time university professor to teach a graduate course in Lean leadership in the spring of 2001. I created this course because of the profound differences between how conventional businesses are led compared to how Lean businesses are led. I learned this first-hand as a manager while working in industry, informed by training that I received from Shingijutsu and my own research and study of leadership. 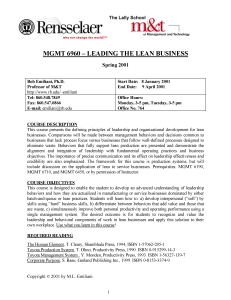 The course, “Leading The Lean Business,” was created for students in M.B.A. and M.S. in management degree programs. It was designed to clearly highlight the differences between conventional leadership and Lean leadership, and give students the practical knowledge needed to help them become Lean leaders. Importantly, my course did not focus on Lean tools as other graduate-level “Lean Leadership” courses did some 5 or six years later (and which were based on an operational excellence theme). My course was a true Lean leadership course. At that time, the focus of the course was leadership behaviors. Today, the course is completely different, and Lean leadership behaviors is just one part of what constitutes effective Lean leadership. You can read more about that here, here, here, and here. The first book, The Human Element: A Course in Resourceful Thinking by Thomas Cleary, presents critically important elements of Eastern philosophy that inform the respect for humanity dimension of Lean management (Toyota Production System and The Toyota Way). The second book, Toyota Production System by Taiich Ohno, is normally read for insights into Lean processes and methods. That was not how I asked students to read the book. They were given specific instructions to read the book through the lens of leadership behaviors. Ohno’s book provides dozens of important details on leadership behaviors if one is prompted to look for it. Next, students read Toyota Management System by Yasuhiro Monden to understand how the seven functional areas of business are interrelated in Lean management, compared to the stand-alone nature of the functional areas as my students experience it in conventional management (Note: Monden’s books on Toyota’s production and overall management system are truly the best and should be read by anyone interested in Lean management). Finally, students read Shankar Basu’s book, Corporate Purpose: Why It Matters More than Strategy, which closely examined Toyota senior management’s strategic decision-making in relation to the company’s purpose, principles, values, and objectives. In other words, the book explored the question: Is Toyota senior management consistent between what it says and what it does? The answer is “yes,” and how Toyota leaders do that is eye-opening. This was the starting point. Having come from industry and trained by Shingijutsu, I continuously improved the course the following semester and each semester thereafter. Learn about the “Lean Teaching” pedagogy I developed in my book, The Lean Professor, which provides a detailed chronological account of my approach to continuous improvement and respect for people in teaching. Click here to see how my graduate course, “Innovative Leadership,” is taught today (enlarge the image to see course details). Textbooks are expensive, they focus on theory rather than practice, the information is often wrong (especially when it comes to Lean management), books are used once, and books are then sold at a loss or lay unused because they are not seen by most students as valuable source of information for future reference. Use found and easily created materials (print and images) to educate students and ultra-low cost visual controls as a valuable source of practical information for future reference. Together, they produce great results.